"Sonar" is the third map in a loose trilogy of sorts by Russian Doomer Lainos. Objects 32 and 33 came before; 32 was a solo release and 33 was the final level of Clan [B0S]'s Da Will. The map as can be expected is for limit-removing ports that support OGG music (the preferred platform I'm guessing is PrBoom+). I'm not entirely sure what the intended story is as the description in the text file appears to be abruptly cut off. From what I can gather, you've been sent to an underwater UAC research facility. I'm guessing that communications were lost, sometime after making a discovery on the ocean floor, and you're supposed to investigate the disturbance, as well as find out what the station uncovered. Object 34, is, well, massive. I didn't understand just how big this map was going to be until I grabbed the automap from a secret earlier on in the level. My jaw literally dropped as I panned around, looking at all of the features I was to explore, later finding out that some elements were of course obscured. They're densely packed in and, to further complicate things, the map layout is incredibly intricate, with plenty of crossovers on bits of machinery or cleverly-plotted architecture. There are some puzzle-solving elements, as well. Some of this has to do with figuring out what to do in order to explore the level, like raising platforms to access a particular ledge, then navigating your way to the step-off point. The fact that this is rarely a matter of convenience is perhaps the biggest strike I can level against this map, but shouldn't pose a problem to people who love to pick apart a level with their brains. Sonar is easily divided into three different sections of roughly equal size. The first two compose the bulk of the playing area and are separated primarily by a series of red key doors that block progress until the first segment is (mostly) explored. The beginning area contains all three keys, which leaves the second zone a bit less clear in terms of progression. I don't know which switches I had to flip in order to open the gate to the third, but it's a safe bet that when you fully explore the rest of the base and hit all the switches, you'll have the door to the exit opened. And you should really investigate as much of the map as possible; there's a lot of unique architecture that gives each room a distinct feeling so that you're not burnt out from the same visuals (and helps avoid you feeling lost). 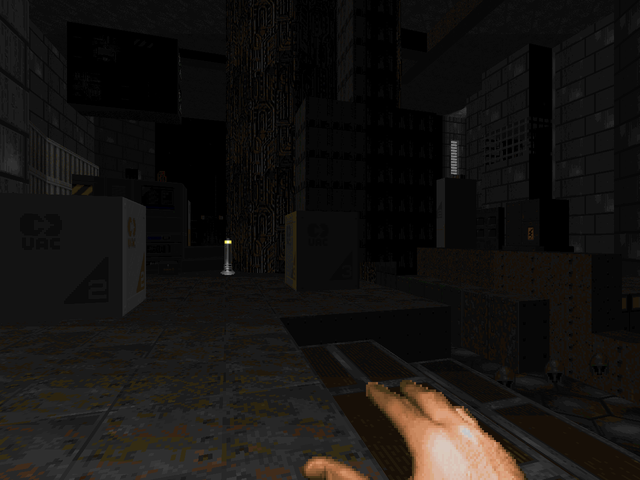 One of my favorite rooms in the first third of the map is a maze of machinery that looks like some mechanical Hell of pistons. It's not very dangerous but looks excellent. There's also a huge waterway in the southern section that makes heavy use of moving platforms that simulate water jets propelling you to different heights, topped off with a towering water-elevator that services four different levels. Navigating precarious perches is a constant theme throughout the map, though the two larger rooms to the north use some tricky platforming as their centerpieces. One of my favorite fights in this earlier portion has a room inundated with waterfalls. The enemies are obscured, creating a feeling of danger, and at some point an inner chamber opens up releasing more monsters whose locations you can't quite be sure of. The defining feature of the second area is a series of recesses defined by an aqueduct that branches in a northwestern direction. It's a little dangerous as you're exposed to enemy fire and the dark depths are usually staffed with spectres. More tricky, too, as you have to do much more movement in three dimensions, triggering switches for bamboo-pole sprints and the like. It's also where you'll find the plasma rifle and BFG, locked away in two separate rooms. Securing these weapons may be entirely optional, but you'll want them when you enter the final area. The ending sequence is in direct contrast to the previous 90% of the map. Yeah, you heard right; the final 1/3 of the map only constitutes 10% or less of actual gameplay, but it's the map's high water mark. You drop through the water in the exit chamber and plummet straight to the ocean floor. There's a variety of sea life in attendance, custom sprites of coral, fish, and even sea turtles. The monsters start out fairly spaced out but pretty soon you'll hear the sounds of monsters exploding into being and realize that you're in a time crunch. The boss shooter is fairly easy to deal with, which is a relief considering the Hell you had to go through to get here. I like the layout of the shooter spawn point, as you can clearly see the location from where the demons have assaulted the base. You're free to do some exploring, though, uncovering a critical cave with a sinister surprise and a lost, sunken city. Is it really R'lyeh? Lainos has not skimped on detail. Each room of the underwater base stands apart from its neighbors without being distracting (or one might say fetishistic). Your normal reminder of your locale is the constant presence of water and seaweed, but if you pay attention you'll see windows in some areas that feature fish sprites that swim back and forth. A very cool touch. 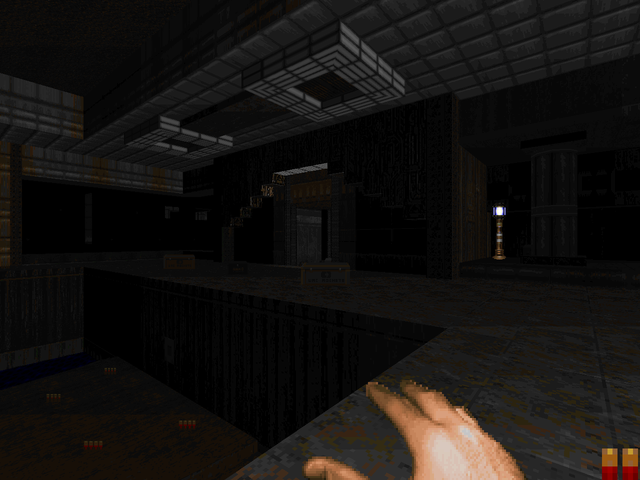 The sheer variety of rooms present coupled with its size may prove daunting for many players more familiar with typical Doom maps. I can't say I was ever confused excepting one particular spot. There's a passageway in the red key room that leads to the northwestern red door. It's hidden on the normal map but the area behind it was apparently the final switch I needed to hit to grant access to the exit. Now, given its close proximity to the red key, it's clear that you're gently nudged toward exploring that area first, but I forgot how to get back there and foolishly relied on my automap to give me the answer. Not really a criticism as much as an admission. 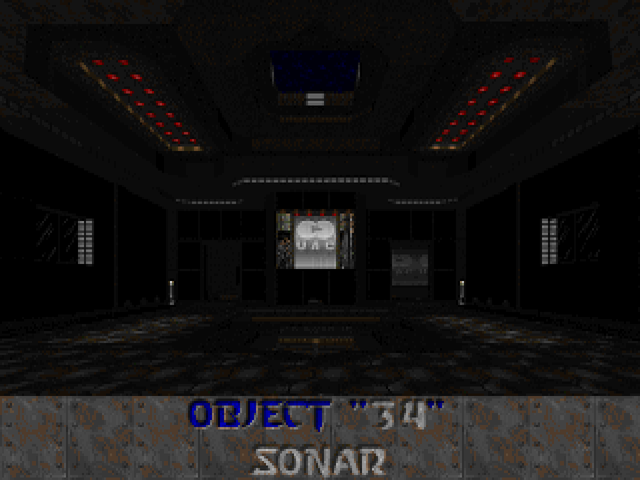 Sonar's combat is typical medium-difficulty room clearing. It's a little trappy, but I can't pick out any of these 900+ monsters as providing encounters more memorable than the others. Well, there's an ambush by Cacodemons up close in cages, plus that aforementioned waterfall battle. Also a fight in a wide open area where the player might rush forward to battle mancubuses only to find two pain elementals at his or her back. With the amount of health and ammo lying around, you're usually pretty well prepped to handle the insurgents. Your main obstacle will be navigating the base itself, a challenge best met by fans of Eternal Doom or similar WADs (Polygon Base comes to mind). I think Sonar is fantastic. It has a great finish and the meat of the level, its base section, looks excellent and plays quite well. It's practically an episode's worth of content compressed into one single, contiguous experience. I also enjoyed its OGG soundtrack, a looping series of four pieces that convey an adventurous spirit, matching the slower-paced gameplay and exploration. Lainos has poured his heart and soul into a masterpiece that in some ways fits in with his previous release, Doxylamine Moon, but shows itself to be a very different animal. I'd say that this is my current favorite WAD for the 2012 Cacowards period, but, ahem, it's the only work I've played so far, so saying that wouldn't mean much at all! Regardless, this map is well worth a look.